Spartans’ chances of silverware and, indeed, their season were ended last night after they were disqualified from the Lowland League Cup for naming an unsigned player in their squad for last Saturday’s 4-0 win over Preston Athletic. Dougie Samuel’s side were due to face East Kilbride in the semi-final on Saturday, but were ejected from the competition after goalkeeping coach Mark Cairns had been named on the substitutes’ bench as a trialist, which is against the competiton rules. Chairman Craig Graham, who completed the Spartans team sheet for Saturday’s game, accepted responsibility and apologised for the mistake. “As a result of having our unsigned goalkeeping coach Mark Cairns named as a substitute on the team lines on Saturday, we have been ejected from the Lowland League Cup,” he said in a statement on the club’s website. “I did the team lines myself and noted Mark as a trialist and didn’t realise that trialists could not play in the competition. 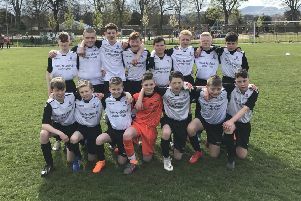 This decision now means Preston Athletic will take Spartans’ place in the semi-finals and will travel to K-Park on Saturday aiming to reach the final for a second-successive year.